Google really, really wants you to use Bluetooth headphones. So much so that they’ve gone and made a new process for connecting their smartphones to audio devices. This is called Fast Pair, and it’s not just limited to the Google Pixel 2. Users with any Android device running Android 6.0 Marshmallow and forward with Google Play Services 11.7+ can make this bit of magic happen. As our own Chris Davies described earlier this month, the Pixel 2 has this super-simple Bluetooth process as well. 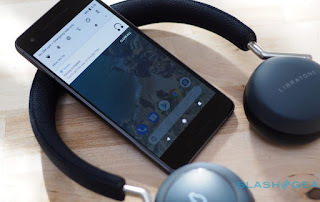 Fast Pair allows the Google Pixel 2 to connect to devices made by Libratone, AiAiAi, and Plantronics – their newest headphones, anyway. Devices with the Fast Pair ability will be noted as such on their product boxes in the near future. 1. Turn on a Fast Pair-enabled device and put it in pairing mode. —- Android scans for BLE broadcasts in close proximity of the user’s phone and discovers a Fast Pair packet (provided Bluetooth and Location is turned on). —- This packet is sent to our servers to get back the device’s product image, product name and companion app (if there is one). 2. The user receives a high priority notification asking them to “Tap to pair” to the device. The notification contains the product name and image. 3. When the user taps on the notification, we use classic Bluetooth to establish a connection. 4. A success notification is shown which contains a link to download the companion app (if there is one).